Do you struggle to find a concealed carry holster that fits your body well and doesn’t print, no matter what you wear? I’m here to tell you about the Brave Response Holster, a belly band holster that may just be the answer to your concerns. Something to know about me: I am a very, very small person, which can make comfortable, effective concealed carry difficult. So when our editor, David, asked me to review the Original Brave Response Holster I was wary. I’m always willing to try new holsters in hopes of discovering more concealed carry options, though, so I agreed. Besides–I’m not about to turn down the opportunity to try new gear and get paid for it. The Original Brave Response Holster is a belly band holster advertised as “the most comfortable, highest capacity concealed weapons holster in the world.” Brave Response designed the holster to be comfortable and functional with any semi-auto handgun and with any clothing. We were skeptical, to say the least. But does the marketing actually reflect the holster in the real world? I tested it to find out, and I’m sharing what I found with you. Let me tell you just why this holster is a fantastic option for concealed carry. To get a feel for this holster, I wore it for a few days while going about normal, day-to-day type activities. As a writer, I don’t leave the house as much as the average person and I don’t usually carry while at home. With that in mind, I specifically chose to test this holster on a couple of days when I knew that I’d be away from home, either running errands or visiting with friends. Remember–it’s only science if you write it down… which is what I’m doing now. I wore the holster a couple of days while I worked to get a feel for what those of you who carry at desk jobs might experience. I also wore the holster when I left my apartment, like when walking the dog or going to check the mail, so I could get a feel for how handy it is. In addition, since the Original Brave Response Holster was designed for use while active, I even wore it while working out. I jogged a couple of miles while wearing the belly band to see how it handle the motion and I wore it while doing some yoga to really test the limits of the holster’s retention. The Original Brave Response Holster stands up to concealing a full-sized handgun like the 1911. For my tests, I carried a Glock 19. After all, it’s one of the most popular CCWs and a gun I use as a CCW with some frequency. I used a full-sized 1911 to test functionality, too, for those who like to carry a full-sized weapon. 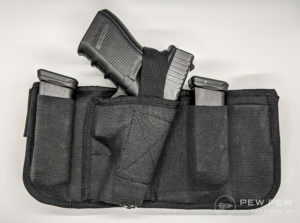 Since I have a smaller-than-average body type, I also drafted normally sized human and fellow Pew Pew Tactical writer, Matthew Collins, to help me out with this review by giving me some feedback on how this holster works on more average bodies. Like me, he wore the holster for a few days while going about normal, day-to-day activities. So, without any further delay, let’s talk about the holster itself! 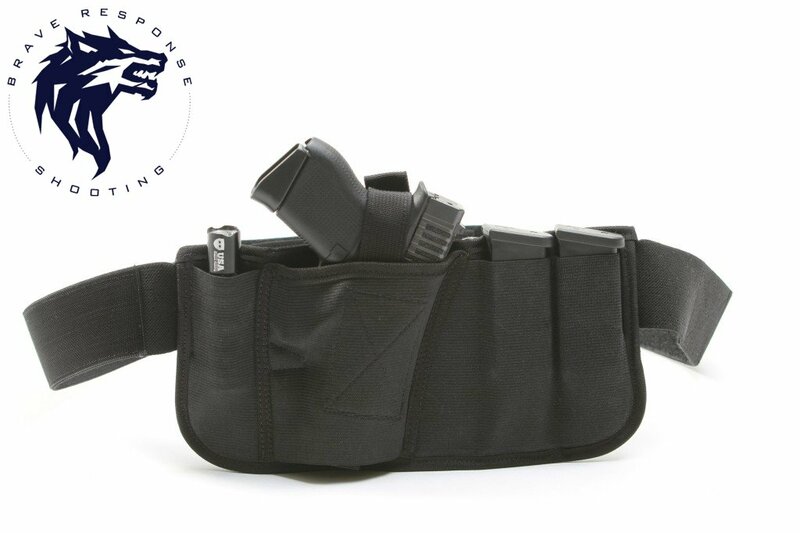 Like most belly bands, the Brave Response holster secures around the wearer’s hips or waist with an elastic band. 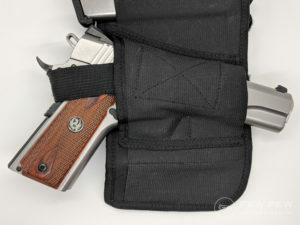 However, while most belly bands are wide elastic bands with pockets in the elastic to hold your firearm and magazines, the band of the Brave Response holster is only 2” wide. 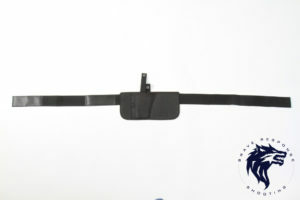 The Original Brave Response Belly Band Holster uses an elastic belt to attach to your body. The band attaches to a canvas panel, about 5.25” tall, which has pockets for a gun and three magazines. The elastic fronts of the pockets hold their contents firmly against the canvas panel. Brave response calls their canvas “Sharkskin Canvas” because it’s highly durable and should even stand up to cutting and tearing. Now, I didn’t attack the holster with a knife or anything, but the material definitely seems rugged enough to stand up to anything that could reasonably happen to it while it’s being worn. Despite the sharp-sounding Sharkskin Canvas, this holster is comfortable to wear. The elastic is also high quality – it’s thick enough to be durable, but soft enough to be flexible. Finally, Brave Response offers a two-year workmanship warranty, so if you have a problem with the holster, like torn stitching, you just have to send it back and they’ll repair your holster or send you a new one. Versatility is a major advantage for this holster. If you want one holster that works for multiple guns or that can be shared among multiple people, the Original Brave Response Holster is a great option. Here are some of the ways the flexibility of the Original Brave Response Holster shines. For one, Brave Response says that their holster will fit any semi-automatic pistol and I believe it. The Original Brave Response Holster fits about anything–including my 1911. Both the Glock 19 and the 1911 (a Ruger SR1911, if you’re curious) I tested fit securely. Subcompacts might be a little loose in the holster, but the removable retention strap will still keep them in place. 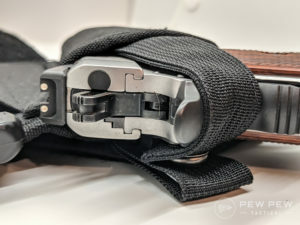 The retention strap attaches to the holster with velcro, and the inside of the gun pocket is actually velcro lined. This means you can adjust the placement and height of the retention strap to that best for holding your firearm of choice. The adjustable retention strap with the thumb release snap. Three mag pockets might seems excessive, but they can also be used to carry a pocket knife, flashlight, or similarly sized item. This is super handy for taking some of that extra weight from your EDC items off your pants or for being able to carry more of your EDC items when you don’t have pockets or have limited pocket space–a situation women often face. Plenty of space for my Glock 19, back up magazines, lights, or whatever else I carry. 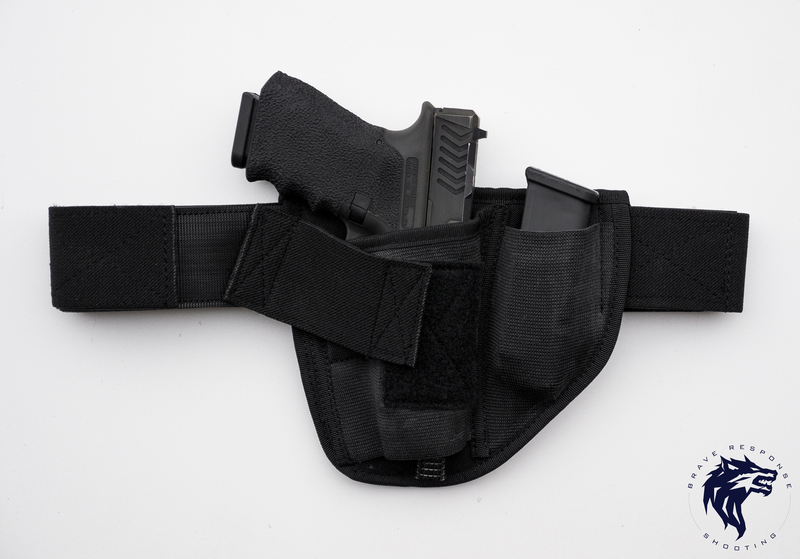 As it comes from the factory, the holster fits 30” to 54” waists, but you can cut off any excess waistband material for a smaller build or get the extension from Brave Response, which allows it to fit waists up to 70”. The Original Brave Response Holster gives you plenty of adjustability. If I were to use the holster long term, I’d definitely need to cut some extra length off the band. However, if I wanted to share the holster with someone who needed the extra length, we could still use Brave Response’s extension to add an extra 16”. This holster isn’t ambidextrous, but Brave Response does offer right- and left-handed options so you can still get a version that suits you. The left-handed version of the Original Brave Response Holster. 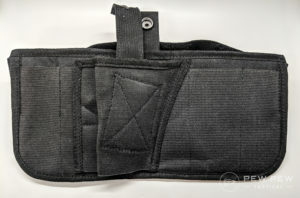 I was also impressed with the functionality and safety of the Original Brave Response Holster. In my experience, many belly bands don’t offer adequate trigger protection, but the Original Brave Response Holster completely covers the trigger. If you’re looking for better trigger protection, the Brave Response holster is the way to go. 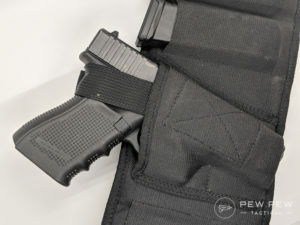 I was pleasantly surprised at the holster’s firm retention–even without the retention strap–but I definitely recommend testing it out with your preferred handgun before relying on the holster without the strap. I didn’t have a problem drawing from the Brave Response Holster, but like with any holster, you’ll want to practice to make sure you’re completely comfortable with it. The holster positions the gun at a bit of a forward cant, which I thought made drawing easier, but some shooters might find awkward, especially if used to a holster without a cant. The holster’s cant is especially obvious with a 1911. Holstering your weapon is a little trickier with this holster. When I was first trying it out, I had difficulty consistently placing the muzzle between the layers of the holster, but it definitely got easier the more I holstered my gun. 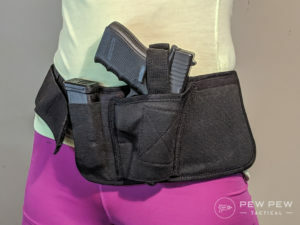 The holster is quick to put on and take off, so it’s great for taking out the dog after dark or for when I’m out running errands and need to go somewhere where carry isn’t permitted, like the DMV or post office. On a more personal note, anyone who’s carried with any frequency knows that trips to the bathroom can be a little tricky with a concealed weapon. 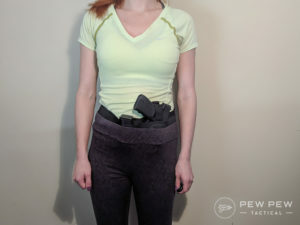 Just try keeping yoga pants up with a regular IWB holster–I dare you. Not so with this holster. I just hoisted it up before dropping my pants, then returned it to its position when I was all done. I love that the gun totally stayed on my body and I didn’t have to deal with the extra weight of the holster and gun when refastening my pants. I only had a couple of minor problems with functionality. 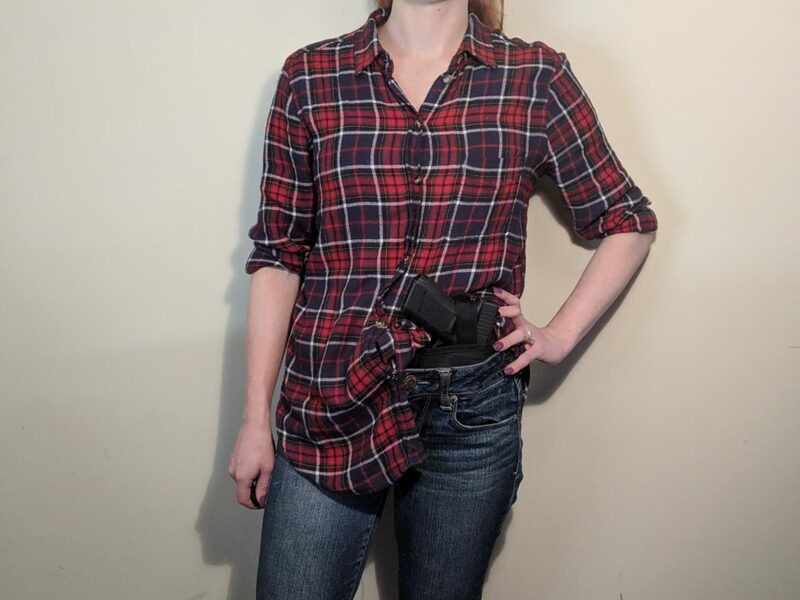 First, when worn with jeans, the pocket in front of the holster became basically unusable because of the bulk of the gun, but they’re women’s jeans, so it wasn’t a high bar in the first place, and this is a problem with pretty much any IWB holster I’ve tried. Front pockets are already tiny in women’s jeans, but this holster renders them unusable. Matt tells me this isn’t an issue with a larger build and men’s pants, since there’s more room and larger pockets to work with. Second, if I wore the holster too low on my hips, I noticed that the holster would shift so the gun moved closer to the center of my body as I walked around. I suspect that my hip bone was actually pushing the gun as I moved, and once I figured out the best way to position the holster, the shifting was no longer an issue. Once again, Matt didn’t have this problem. The Brave Response holster is one of the most, if not the most, comfortable holsters I’ve ever worn. It holds the weight of the contents close to your body and distributes it well, but it’s still flexible enough to be comfortable to move around in. I didn’t experience any twisting or folding. It’s also quite breathable, unlike most belly bands I’ve tried. I did experience a little bit of rubbing from the grip of the gun when I wore the band against my skin, but when I put on an undershirt it was no longer a problem. The holster’s soft backing prevented rubbing from the holster itself. 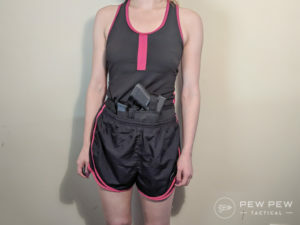 I tried the holster with jeans, leggings, and running shorts, and it was definitely more comfortable with the latter two (but what isn’t more comfortable in leggings or running shorts?). 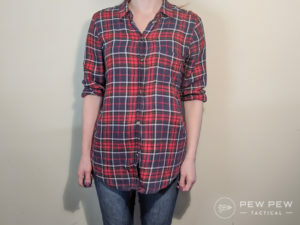 I could definitely wear it all day with the jeans without significant discomfort, though. The Original Brave Response Holster can be worn whenever you need it, including on the running trail. When I added a belt with the jeans, it became somewhat uncomfortable. That was fine with me, since I hate wearing belts anyway, but if you wear a belt every day it’s definitely something to keep in mind. Regardless of the pants that I wore it with, the holster never slipped or felt insecure even while working out in it. While running in the holster, I could definitely feel a bit of bounce, but it wasn’t uncomfortable or distracting. 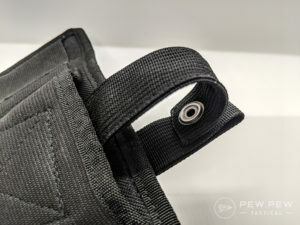 If you’re used to a firmer kydex or leather holster, this canvas and elastic holster may not feel secure in comparison, but that’s just psychological rather than an issue with the holster. You’ll get used to it in time. Concealability is where I had the most problems with this holster, but that’s true with most holsters due to my size. 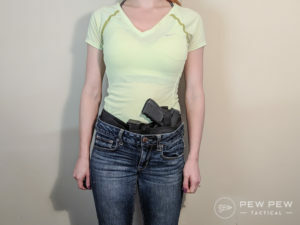 Because belly bands fit close to the body and have a very low profile, I usually have an easier time concealing with them, and that trend continued with this one. This holster was easy to wear under my daily clothes while keeping my gun handy. 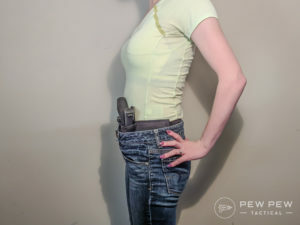 I had a much easier time concealing when wearing the holster in an appendix carry position around my hips than when wearing the holster around my waist, but that suits me fine since I hate carrying on my waist. I find it less comfortable and much more difficult to quickly access my firearm. When appendix carrying a Glock 19 and spare mag in the holster, I experienced little to no printing in my typical cold-weather carrying clothes. 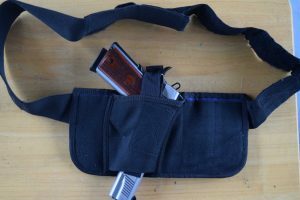 In most waistband holsters, even a compact pistol is too big to carry on my small frame without printing no matter what I wear, so this holster actually allowed me to carry a larger gun that I’d typically be able to. You have to know I’m carrying to spot the print under my winter outfits. I was even able to conceal the G19 in running shorts and a loose workout tank top, but not with my everyday warm-weather clothes. For those, I’ll have to stick with a subcompact and with a subcompact, I’d probably elect to go with a holster that will fit a subcompact more securely, like the Can Can Concealment Hip Hugger or Sport Belt. It’s a little harder to hide this holster in my summer wear, though. Regardless of clothes, I had problems printing with the holster totally full. The mass of the contents was just too large compared to the mass of my body. 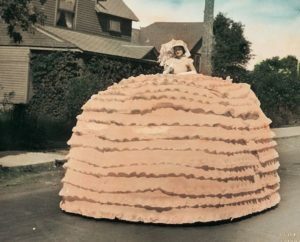 I wouldn’t have been able to conceal it no matter what I wore it with, except for maybe a mascot costume or one of those old fashioned hoop skirts. Pretty sure I could hide a tank under this thing without it printing. But once again, these aren’t problems for average sized and larger bodies. Matthew didn’t have a problem concealing even with a full holster, including a 1911 instead of the Glock 19. Ultimately, I was very impressed with the Original Brave Response Holster. While I still had issues with concealability, they were mostly due to my small stature. Furthermore, the issues were far less severe than I’ve had with just about any other holster I’ve tried, and this holster was actually effective enough at concealability to make carry a compact pistol feasible, something that I haven’t been able to do in the past. That opportunity alone is definitely worth $70, the holster’s retail price. We’re a fan of the Original Brave Response Holster! For those of you who don’t have the same concealment issues that I do, the comfort and breathability of the holster definitely make it worth it. Even if you don’t use it as your everyday holster, the Brave Response holster is great for when you’re wearing pants with a stretchy waistband or are being particularly active, even in more structured pants. Brave Response also makes the Appendix Carry Holster, which I haven’t tried but I suspect is even more small-build friendly. Brave Response says it’s even more comfortable and prints even less due to a strap that pulls the grip closer to the body. 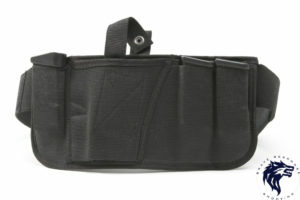 It only has room for your gun and a single spare mag, so it has less bulk than the Original Brave Response Holster. The Brave Response Appendix Carry Holster has a smaller footprint, perfect for smaller bodies. I’m hoping to get the chance to try it soon and give you a firsthand account, but smaller shooters will definitely want to give it a look as well. Have you ever tried the Original Brave Response Holster? If so, were you as impressed as I was? Share your thoughts in the comment section below! Discover more ways to carry concealed with our Women’s Guide to Concealed Carry. Each body armor is labeled with the information that what kind of protection it provides. The higher the number on the protection, the higher the level of protection it will offer. For example a bullet proof vest with level IIIa protection will provide a higher level of protection than a bullet proof vest with NIJ Level II protection.